Jan explains the layers of ladies' fashions. Mike shows the group his antique Civil War sword. Nancy , Connie, and Jan listen while the "menfolk" talk about all that military stuff. Tom listens to questions after talking about his new Jennings County book. 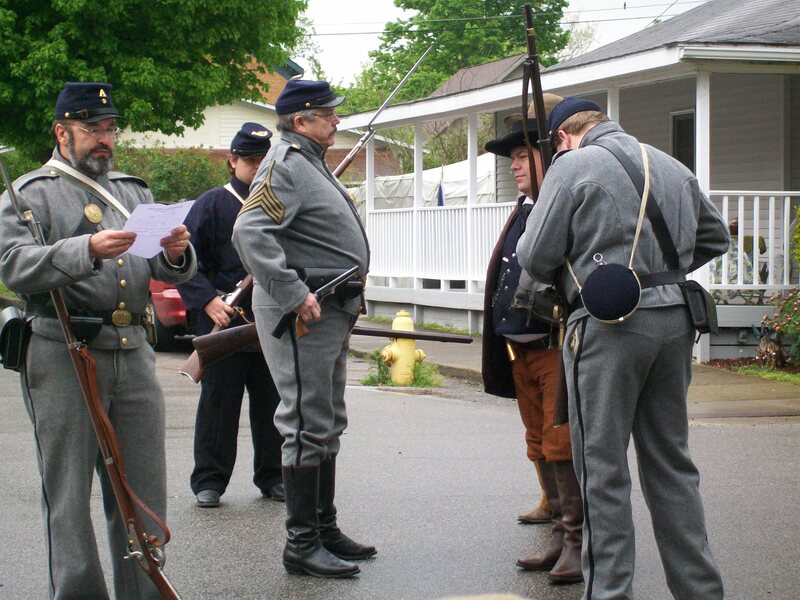 As Terry listens, Rick, in the "new" Greys uniform, talks about the history of the Vernon Greys in the Civil War. The Greys react to news of "Copperhead" Jay Kell's arrival in Vernon in a skit put on Saturday morning. As Rick reads Jay's arrest warrant, Justin begins to search Jay's belongings, Robert stands guard, & Mike officiates. The ladies gather for a picture downtown Vernon. The Greys and wives gather to talk before the dance begins. The Ball was great fun for all as the Skip Jack Band performed. Rick enjoys a morning coffee near the Greys' tents. 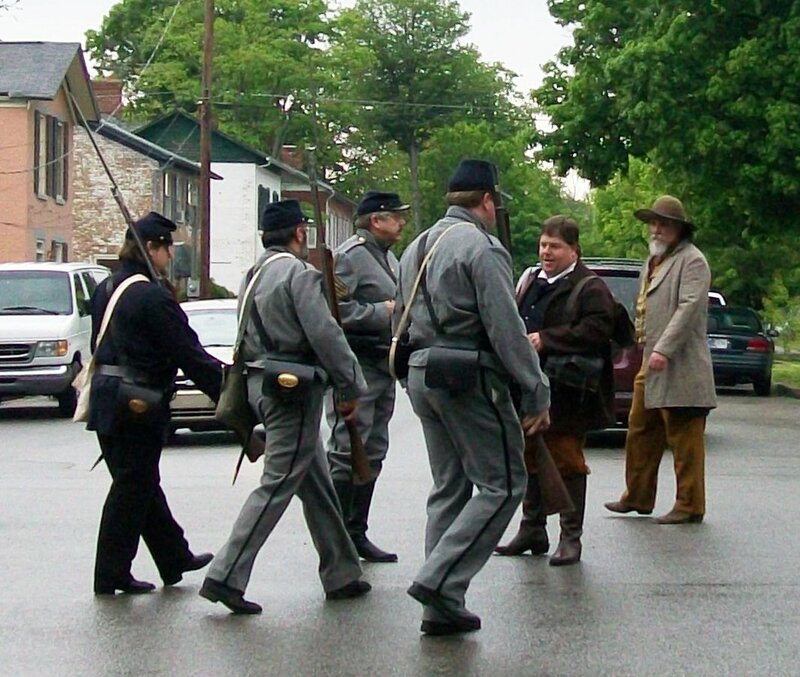 The union soldiers fall-in for some drill on the streets of Vernon. First company stands at the ready as second company with Mike & Terry pour the powder into the Rebs. At the mid-point of the battle a truce was called to take the "dead and wounded" to the side for treatment. 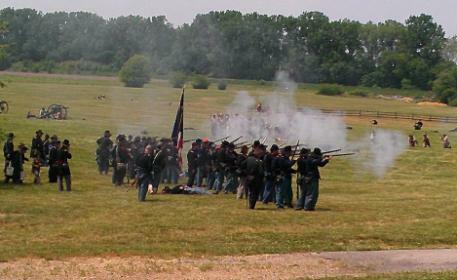 After the battle both Union & Confereate troops salute the crowd. Rick, Justin, & Terry march off the field. Under the leadership of Capt. 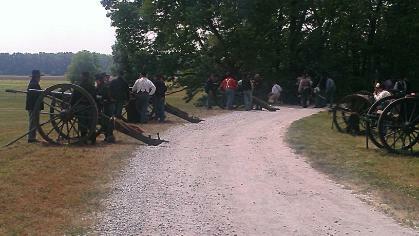 Rob Van of the 49th IN, Union troops clear muskets at the end of the battle (Mike at 2nd R ). Front: Jan Furgason & Janaye Day Back: Mike Ochs, Terry Furgason, Rick Apsley, Justin Posey, & Robert Mitchell. Mike checks out the gun display in the shelter house before settling in at camp. Union troops, to be joined along the route by dismounted cavalry, form to march to the cemetery for a tribute. Rick, Mike, Justin, & Jeff Stein (32nd IN) relax before battle. Camp is filled with the sounds of fiddle music. Mike discusses battle plans before his first command Sunday. Joined forces of 32nd IN and 6th IN after Sunday's battle. Mike & Justin & the 11th gear up for the battle. Terry & Justin ready to take the field. Mike, Justin, Rick, Terry, & Marvin find shade before ceremony. The Greys fall-in behind the veterans. Mike Eastman delivers his part of ceremony. The Greys fire a salute with the veterans. Marvin says words over grave of original Grey Thomas Patrick. Greys salute graves of Grey's Thomas Patrick & W.B. Patterson. List of soldiers in Ebenezer Cemetery. Grave markers of Thomas Patrick & W. B. Patterson of the 6th IN Infantry Co. B. 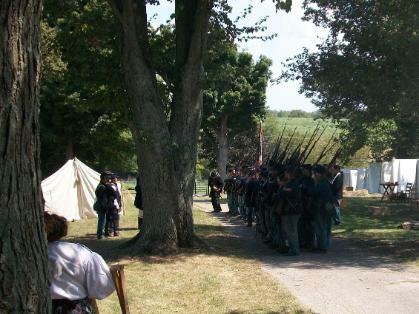 The Greys rest-on-arms in ceremony for Civil War soldiers. Abe Lincoln (David Wolfe ) shares a story with Bob Jacobson. Dr. Thelonius Balthazar (Mike Follin) entertains members of the audience including Justin, Mike, Janaye, and Jan.
Texan Jed Marum entertains with guitar, mandolin, banjo, and banjolin near the Lanier Mansion. 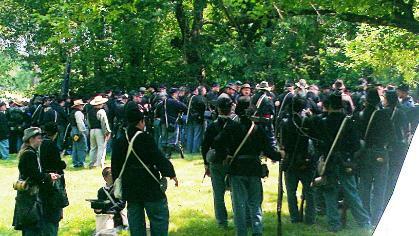 Union forces form a skirmish line to battle the Rebels. Union & Rebel forces salute the crowd after the battle. As the Greys break ranks, General Thomas (David Hughes) and his wife Susan discuss the Civil War with a spectator. Jan and Janaye use Dutch ovens to prepare a delicious meal for the Greys which was followed by apple pie from Connie. 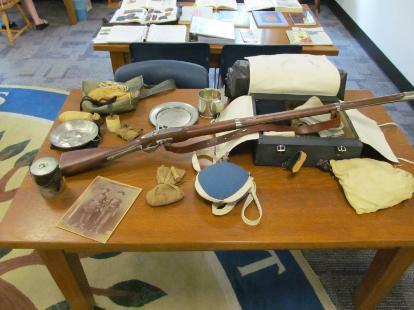 Justin and Rick educate the public about Civil War soldier's gear and the history of the Vernon Greys. As Justin tends to Rick's "wounds," the Greys return to the battlefield for another battle with the sneaky Rebels. Jeff Stein talks to the audience after the battle. Members of the 4th IN Cavalry pose with the Greys at camp. Greys primp for the presentation. Greys wait for their turn on the agenda. A board member talks to the group after the presentation. Major Stein talks to a recruit as Mike ans Allen Weise talk. Mike and Allen watch a hot-air balloon as it inflates. Union troops prepare to march to the battlefield. Mike and Terry clown around in camp. 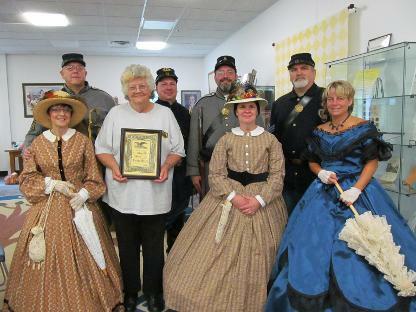 Nancy, Jan, and Connie talk about ladies of the Civil War. Marvin tells of the clergy from Civil War as he read a letter. Before Rick presents, Mike uses him as a demonstration model. Terry displays picture of 6th IN relatives - ancestors of Nancy. Rick has many display items for the Vernon Greys & 6th IN. The Greys prepare to fire a volley in front of the college building. Greys camp at left with the other education booths. Rick explains the Indiana Legion to visitors. Terry explains how the gray uniform was common to the Indiana Legion and US troops of the early war. 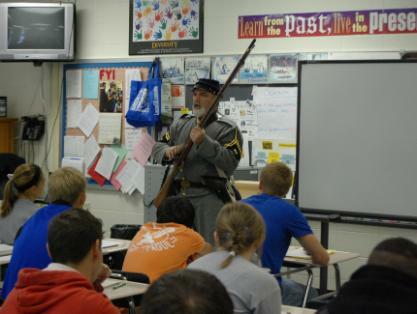 Terry demonstrates the Civil War rifle as the soldier prepares to aim and fire. Greys have a light camp set-up with dog tent and fly. Nancy and Jan prepare the cooking for the day. Rick draws in onlookers with his knowledge of the Legion in counties other than Jennings. Jan answers questions about cooking with Dutch ovens as she prepares another delicious meal. Terry and Rick fire a volley on the hour, which also brought questioning spectators and their curious children. 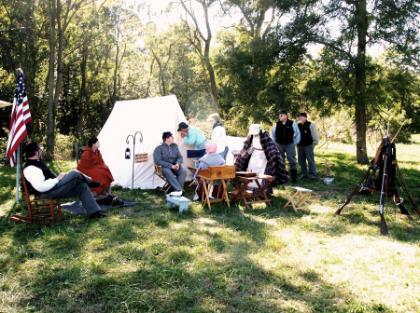 With the threat of bad weather, the Greys set-up their camp in the smokehouse where Rick expounds the Indiana Legion. Mayor Harold "Soup" Campbell delivers opening words. Mike and Terry join veterans to fire a salute. Gene Rudicel tries to keep dry before playing "Taps."